The Material Thickness Meter PT-UTGM is an ultrasonic speed measuring device for detecting material thickness and wall thickness. 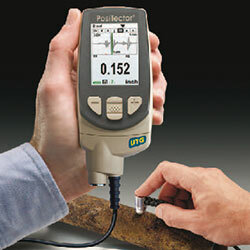 Included in delivery with the Material Thickness Meter is a 5 MHz probe. This cover nearly 95 % of all possible applications. Therefore the use of the other probes of the Material Thickness Meter is not necessary. The Material Thickness Meter with the adjustable ultrasonic speed is used for accurate measurements of low carbon steel and carbon steel also aluminum, titan, plastics, ceramic, glass, ... and many other materials. The Material Thickness Meter also offers the option of accurate material thickness measurements of coated materials. Because of his multiple echo it is possible to diagnose cursorily coatings. The Material Thickness Meter offers an adjustable sensitivity, you also can diagnose PE-coated steel tubes of its material thickness. The measured data can be stored in the device and transferred by the optional software-kit to a PC. The data also can be transferred to a processing program, e.g. MS Excel. Another advantage of the Material Thickness Meter PT-UTGM is that its menu is available in several languages, e.g. German, English, Spanish, Italian, French, ... The software will be delivered in your national language when the device is ordered. 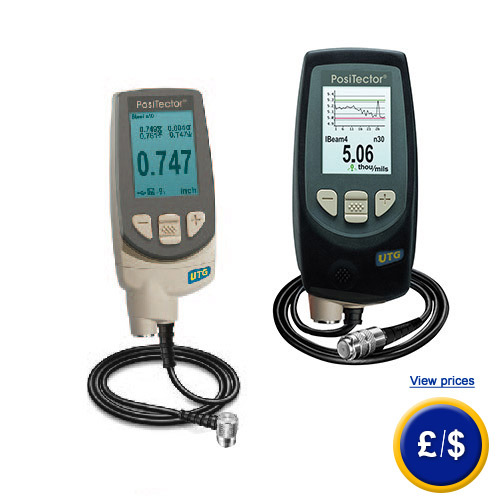 If there are any questions about this Material Thickness Meter, please have a look at the technical specification below or call: UK customers +44(0) 23 809 870 30 / US customers +1-410-387-7703. 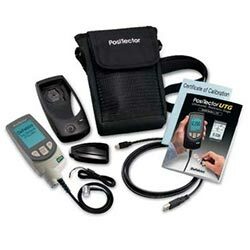 Our technicians and engineers will gladly advise you in all thickness meters and all products in the field of measuring instruments, laboratory equipment, regulation and control and scales and balances of PCE Instruments Ltd. Shipment of the Material Thickness Meter PT-UTGM. The Material Thickness Meter PT-UTGM in application. The PT-UTGM Material Thickness Meter can be used in both normal and scan mode (only for the standard model). With the scan mode it is possible to measure large material areas. The PT-UTGM Material Thickness Meter can save up to 250 measurement values in its internal memory (with a measurement rate of 20 values every second). 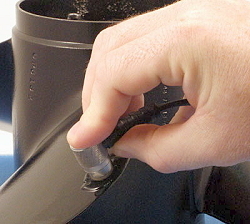 It is very important to use the coupling gel properly during the measurement; in the normal and scan mode. This ensures a good contact with the sensor and protects the surface. The upper image shows the use of the PT-UTGM Material Thickness Meter in a ship propeller. 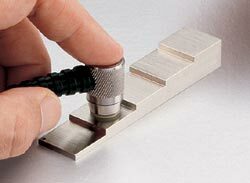 A recalibration of the Material Thickness Meter can be performed with the aid of a calibration block.